Though the bulls pushed the price over $6,500 in the last 24 hours the momentum has stalled with the daily budding against the 30-EMA. Though Bitcoin could be starting to shape an Elliott Wave going into wave three the odds of this being the case are not favorable. Bitcoin remains in limbo with the indicators mostly neutral on the daily chart. Of concern is Bitcoin remaining wedged between support and the long-term resistance that has been in place since the run to $20,000. Since Bitcoin remains trapped between two critical positions we are not considering this to be a trade zone as the risk/reward for either a short or long is too great. As with the previous analysis we will wait for a break to take a position. If Bitcoin bulls take charge and push the price of BTC over $6,800 for three days we will long BTC as this will give sufficient support that the move is solid and likely to increase to $7,500 to $8,000 levels. On the downside $6,150 is acting as short term support. A fall below this price point will likely see Bitcoin retreat to the longer support level of $5,600. If BTC moves below $6,150 we will look to short to these levels. 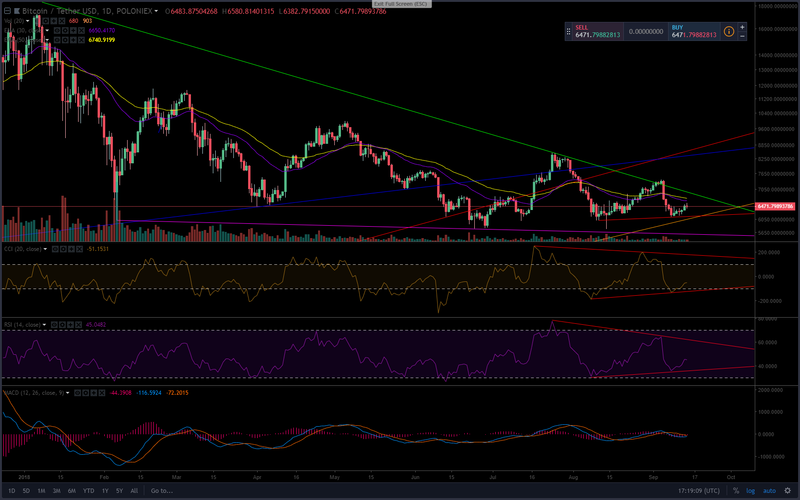 As this would be the fourth test of this critical support zone it is likely to break under bearish pressure leading to the next major support line for Bitcoin at $5,000.